Despite landing jobs on an epic scale (Star Wars), Jonathan began looking at his career and profession and started asking himself, despite success why did he still have low moments? He felt sure he wasn’t alone so decided to see if he was right. The Honest Actors was born. A podcast not about interviewing actors about what they were working on and promoting, but the opposite. What did they do when they were not working? Hi Jonathan, thanks for taking the time to sit down with us. Over Christmas I spotted you in the world’s biggest film, Star Wars. That’s super exciting, how did that come about? Ha! You’re not the only one! It was something I wasn’t allowed to talk about for a long time, so loads of friends didn’t know to expect me and apparently made a variety of inappropriate noises when I popped up. Bizarrely, I was moving house the day of the screening, so I missed it and I haven’t been to see the film yet. I’m toying with the idea of waiting until its on TV at Christmas, since that’s how I remember seeing the original films! As to how it came about, I auditioned for The Force Awakens and didn’t get it, but then at Christmas two years ago, while that film was in the cinema, I got a call from my agent asking, “How would you like to be in Star Wars?”. I thought he meant I had another audition, but then he said that I’d been offered a part and that someone from the production would be in touch to tell me more. I didn’t hear anything more until a few months later, when wardrobe got in touch to book in a fitting. I only found out what I was playing when I saw my costume on the rail. I’m not a Star Wars obsessive, but being a rebel is probably the coolest thing I’ll ever do. So your career is going pretty well if you are getting called in for work of that magnitude…? Ummmm. Yeah, I can see how you might think that, and my nieces and nephews seem to think I’m a Jedi, but I could definitely be doing better! I guess it’s all relative. There are people working less and people working more. I need to learn to be happy in the middle, but the more you do, the more you want. Most annoyingly, the more you succeed, the more you trick yourself into believing that there’s a trajectory that works like a regular career. There isn’t, but I sometimes forget that. And when I do, I feel like a failure and a fraud, and very often consider giving up and doing something else. Then I remember that when I’m working, it’s the greatest feeling in the world. All I want is to survive by acting alone, and ideally, occasionally do some interesting work.  Over the past 2 years you have been the voice behind Honest Actors, the brilliant podcast that actors have flocked to. Can you describe it for someone who may not have heard about it before? I got fed up being out of work and listening to other actors talking in interviews about their amazing careers, tweeting about great auditions and instgramming pictures of them in costume on some set in an exotic location. I knew I wasn’t the only one who felt like this, but I also knew that there was no platform to express the realities of the industry. Nobody was tweeting about their day jobs, or their lack of auditions Why would they? The initial idea was “wouldn’t it be great to hear Judy Dench talk about the times she was out of work and panicking about her career, or perhaps that she’d considered giving up”. It got more refined than that, but in essence, it’s about having honest conversations with actors about what they do and how they feel when they’re not working. And the aim is to improve mental health. At first I wondered if anyone would listen, and at the same time worried that if it took off, I’d become defined as ‘the podcast actor’. They did, and I have. Now every time I walk into a rehearsal room, a makeup truck or even a casting suite, someone mentions it. I guess it struck a chord or filled some kind of void. The biggest compliment is that a few others have tried doing similar things since I launched Honest Actors in 2015. The more the merrier! Something I think people love about Honest Actors is it shows that despite having these brilliant actors who have great success, actors still struggle no matter what. Would you agree? Like I said, it’s all relative. I remember being in the back of a car, beside a much more successful actor, en route to set, and he was panicking about what he was going to do once that job ended. I knew then that for most actors, the search never ends. Success is irrelevant. Forget being ‘in the moment’ in a scene, I suspect most of us struggle to truly be present for and enjoy a job because we spend too much time worrying about what’s next and how what we’re working on will affect that, for good or bad. We need to learn to enjoy the work we’re doing when we’re doing it. I personally had never listened to podcasts before I came across The Honest Actors, now I listen to lots….mainly on the train or in the car. Has it surprised you the reaction you have got from it? Yup! It was a bit overwhelming at first, but definitely in a good way. I have never had a single bad comment about it, which is kind of bizarre for something that lives online. When I pulled the plug on the first series, and started looking for a sponsor, that’s when the response was most incredible and I began to realise that people weren’t just passively listening but had also made a genuine connection and really cared about the show. So, I guess I’m resigned to being ‘the guy from the podcast’ by now. There are worse things that I could be known for. I used to say that as an actor, all I wanted was the respect of my peers. I kind of got that with the podcast, but sadly it was nothing to do with my acting. We listen to these actors on the podcasts and each story is different. Is there anything you have learnt from speaking to these actors that stands out? ‘It’s not a race’, ‘stay in your own lane’, and ‘have other things that make you happy’. So an extensive and varied CV now with Star Wars to add…what advice would you give to graduates coming out? I didn’t train, so I have no idea. I guess I’d say, “lose the website”, “chill out with the social media spin” and “get some friends who aren’t actors”. Will we be getting a 3rd series of The Honest Actors podcast? Yes. Yes. Yes. Watch this space. Can you tell us how you got your agent? Have you only ever had this one? I had an agent in Belfast for years before I came to London in 2009. Before I moved, I must have written to seventy or so London-based agents that I ‘shortlisted’ from the hundreds in the old Contacts book. It cost a fortune, because each one needed a hard copy of my headshot, a DVD showreel and a hardback envelope. When you added postage, each one cost a few quid to send. Anyway, I got about five replies, all of which were effectively just returning my stuff with a polite and very short ‘no’. I did it again after I moved and got about the same response; only two wanted to meet me. After the meetings though, neither offered to represent me, so I was over here with no agent, and I started to wonder why I’d bothered. I was really lucky though, because I had a half decent showreel from film and telly stuff I’d done in Belfast, and then I had a small part in a BBC period drama that aired a few months after the move, right when I was ready to call it a day and move back to Ireland. Once that was shown, one of the agents I’d met got back in touch, asked to meet again and offered to represent me. I stayed with them for less than a year though. I did a play at the Finborough early in 2011 that got really good reviews, managed to get a few people to come along (again, posting bundles of stuff) and eventually ended up with my current agent. They initially met me as a favour to a friend of their’s who’d seen the play, under the guise of giving advice. They told me fairly bluntly to change my CV, get new headshots, and delete my website. I went home, immediately did what they suggested, and emailed them about four hours later to share the new CV and pics. They brought me back in and, thankfully, offered to take me on. My agent was just starting his list and I was his very first client. What is next for you, I hear you are now directing? I have to do something to stay sane until somebody else hires me! Yeah, I produced and directed a short boxing film last year, which has done pretty well at festivals and off the back of which, I got some money from Northern Ireland Screen and BFI to make another. We’re currently in pre-production, putting the finishing touches to casting, and will be filming in Belfast in a few weeks. The whole thing is a huge leaning curve, but I really love it. And I hope it makes me a better actor too. Thanks so much for taking the time to chat! Please keep what you are doing, you may never know it, but to lots of actors out there its been a real breath of fresh air to put their headphones in and to know they are not alone. Thank you! And good luck with The Artist Hub. It’s such a great idea! Tom works at the Artist Hub and has been an actor, worked in casting and as an agent.